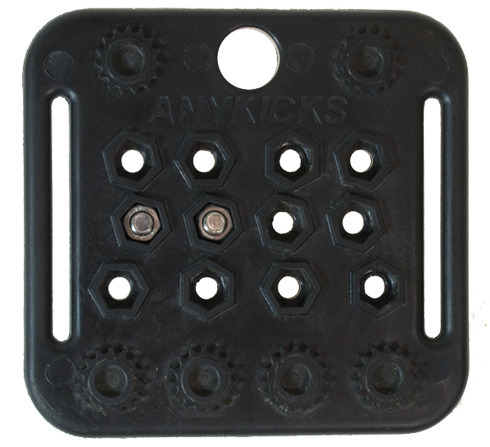 Setting up two hole style cleats is simple with Anykicks. Step 1: Determine cleat placement. 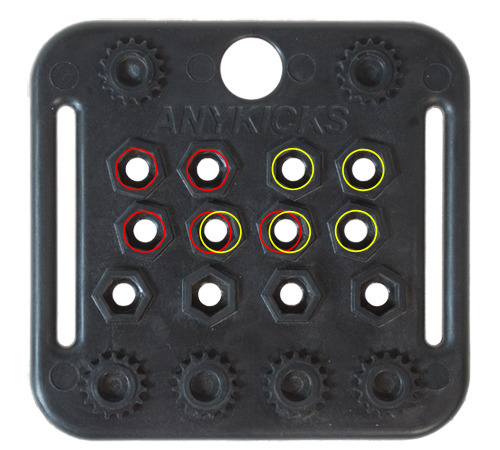 In the drawing below the red circles indicate hex holders that would be suitable for use with the right pedal and the yellow circles indicate hex holders that would be suitable for the left pedal. Exact cleat placement will be determined by how you plan to use Anykicks and what type of pedals you are using them with. Once you have established the pair of holes you will be using, slip a hex nut into each holder. While holding the hex nuts in place flip the plate over and align the cleat with the appropriate holes. Insert the bolts provided with your cleats and finger tighten to keep hex nut in place. Position cleat as desired and tighten bolts alternating until snug.